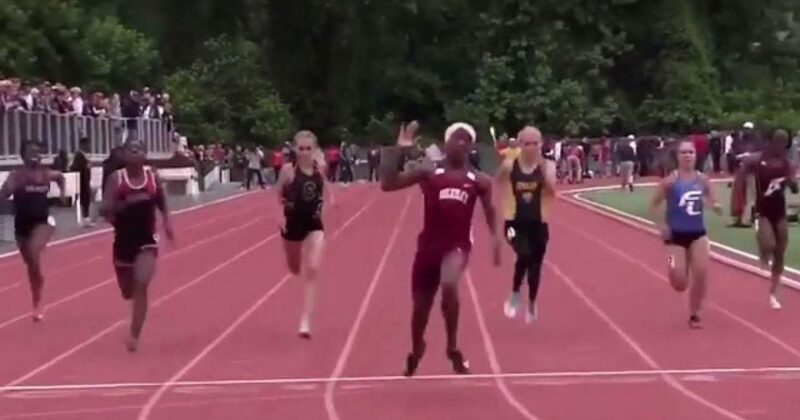 A biologically male transgender individual, Terry Miller, competed in the CIAC State Open track and field championship last week as a girl, and as you probably already guessed, completely annihilated the competition. Surely that wouldn’t have something to do with the massive amount of testosterone coursing through this young man’s body and the fact that he was physically stronger than the other girls in the competition. That would mean that boys and girls are different, and that’s just not true according to the liberals. Miller won the 100-meter dash in 11.72 seconds and took the 200-meter dash in 24.17 seconds — both meet record times, the CT Post reported. Also of note is that Andraya Yearwood of Cromwell High School — another transgender sprinter who won the girls’ 100- and 200-meter dashes at the Connecticut state track meet last year — came in second behind Miller in this year’s girls’ 100, GameTimeCT reported. Several students who finished after fifth place in the race stated that it wasn’t fair for them to race against a biological male and that it hindered their ability to place higher. This is absolutely insane. Schools should not be forced to allow someone who has clear size and strength advantages due to their biological DNA to compete against an entire class of individuals who have a different set of DNA, and thus a very different biological makeup. Sports are supposed to be about equality of competition, where the deciding factor is talent, work ethic, and skill. It shouldn’t be because one is male and the other female.